Miss Print: Blogger's Quilt Festival! 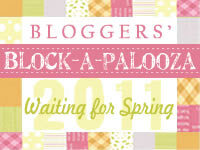 It's that (semi-annual) time of year again - Amy's Blogger's Quilt Festival, hurray! As some of you remember from my last post, I was actually going to share the new flannel quilt that I made using the fabrics Valori Wells sent me from her Bliss fabric line, but for a reason I cannot discuss at this time I'm not able to show it right now. So, instead, I'm going to show you a quilt you may have already seen, but I'm quite proud of it. Without further ado I give you Pinwheels in the House! This quilt was actually my first pattern/tutorial for Moda Bake Shop and I still love it. If you're interested, you can find my project here on MBS. I came up with the idea for this pattern because of my love of mixing different block styles together...I also seem to love half-square triangles, even though they drive me completely batty sometimes! Right now this quilt is sitting and waiting for a little baby girl to be born; we seem to have only little boys in our life right now and this quilt would most definitely be better suited to a little gal! For this project I used Verna by Kate Spain for Moda, and it finishes at 35" square. I have another project in the works right now for MBS, and can't wait to share it with you all! Be sure to visit Amy's blog and check out all of the other super-awesome quilts that have been entered into the festival. I'm going to plead with everyone here to please leave a comment if you see a post with a quilt you like - so many times people put their heart and soul into making something, only to be a little disappointed when no one seems to like it. I know that none of us create the things we do just to get recognition from others, but it sure feels good when we do - I know my heart sings a little every time someone tells me that I did a good job or that they like something I've made. Now I'm not saying you need to comment on every single quilt (that might be a bit of overkill, hah!) but if you see something you really like, show it a little love! Sorry if that sounded preachy in any way, I just want everyone to be happy that they participated! Note: I had to remove the giveaway for now because I didn't realize that we were prohibited from offering giveaways in our festival post this time around. I'll post the giveaway as a post by itself shortly. It's very pretty Kaye - I love pinwheels in just about any setting, but inside the log cabins they look fabulous! Such a gorgeous quilt. 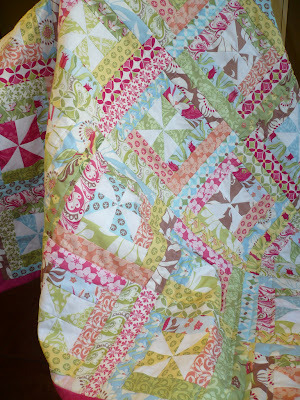 I love pinwheels and the fabric is so pretty. Yep I will be commenting my litlle heart out over the weekend. So so lovely. What a great idea to combine the pinwheels and log cabins. I think it's sweet that you are gently reminding folks to leave comments - it's so easy to click through, but means so much to reach out and communicate with eachother. It is a gorgeous quilt and will make a wonderful baby girl quilt. 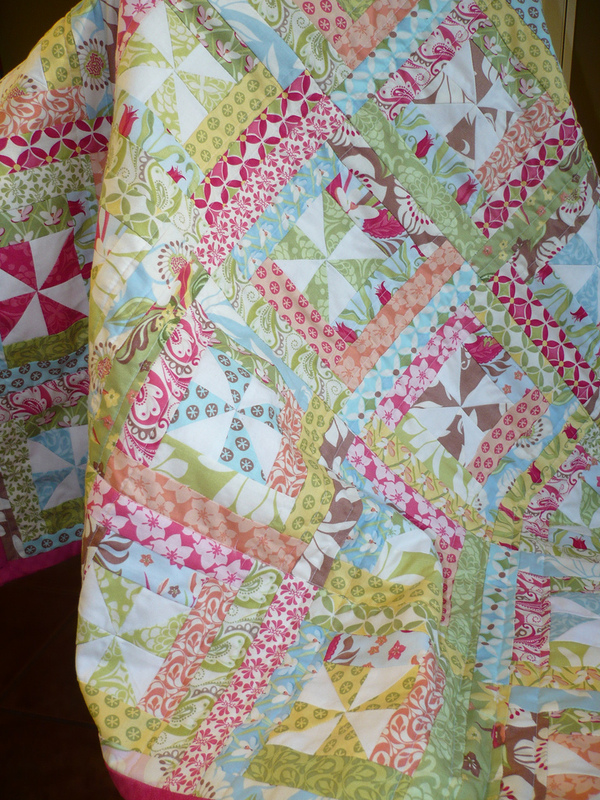 I love your quilt, and hope you get a little girl in the family soon who will love it, too! And I totally agree with you about the comments - it is amazing how much a comment will encourage you and make it all worth it!! Preach on, sister!! 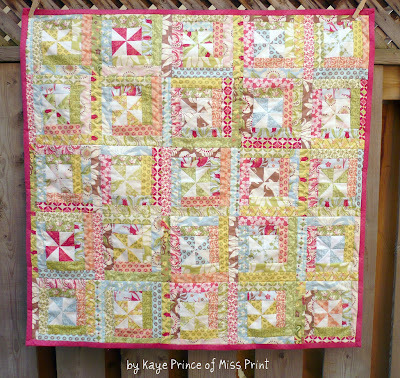 this quilt is just so damn pretty Kaye! And I like your comment reminder, too - I know I love to receive comments so I know everyone else must too!!! Love the colours in this quilt! Love to you!!! Kaye, your quilt is lovely - i am also very fond of HST, and mixed with stripes = very good idea! about the apt.swap: yes, let´s keep each other in mind for this, Canada is definetly on my list of to-go-places!! 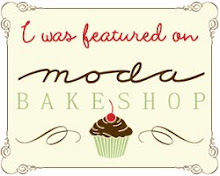 I was looking at Moda Bake Shop for ideas and what do you know! I saw this precious quilt there. You go girl! Such a lovely quilt - I love that line of fabric. super love this quilt, and its like you are sending a message out to the universe that you want a sweet little girl! It's an interesting combination using pinwheels for the middle of log cabin blocks. I'll have to give thew one a tryout. Very fun quilt for a baby girl! I love pinwheels. There was a big pinwheel party quilt along that I did this past year and ever since then, I have been enjoying making many pinwheels. Pretty pinwheel quilt. Thanks for sharing the tutorial!